Winter weddings are becoming more and more popular in Minnesota. Not only are winter weddings beautiful, but there can be many benefits to holding your big day during the chillier time of year. Winter weather might make for difficult travel at times, but we also get to see some of the most beautiful scenery in the country. Winter weddings make for a romantic photo backdrop and beautiful mementos for years to come. You can also use the cozy season to create an inviting atmosphere. The Danish have a concept called “Hygge” (pronounced hoo-ga) that embraces all things winter and cozy. Think thick socks, fuzzy blankets, and candles. Especially in Minnesota, Winter is not the most popular time to get married. Utilize this fact to book the venue of your dreams! Your guests will appreciate it as well, as the summer wedding season takes up so many free weekends when the weather is prime for Minnesota vacations. People usually have fewer plans during the winter, so your guests won’t be suffering from wedding season burnout and will have more fun. Plus, hotel accommodations will be much easier to nail down. The main reason that couples choose winter weddings is to try and save a few bucks – and with good reason. Winter wedding dates give you more room to find bargains and get the best price for decor, flowers, dresses, tux rentals and more. As the season is less busy, many vendors have lower priced options or existing winter decor options. With more options available, you’ll be able to shop around for your wedding items. The Honeymoon is much more appreciated! If you and your intended plan on traveling somewhere tropic, imagine how much more appreciated it will be when leaving during the frigid Minnesota winter! Your tropical getaway will seem all that more magical with a few months between your last visit to the beach or bask in the sun. More Options for your Big Day Look. Simple, slinky dresses are great for some, but the fairer skinned or fashionista types will fare more in a winter wedding. Cooler temps give you more options for layers like a trendy cape or cozy cardigan. Think about sleeves, cashmere scarves, and winter makeup. Short of a blizzard, you’ll pretty much know what to expect from a winter wedding. During the rest of the year, weddings leave a certain degree of guessing when it comes to dressing and planning a wedding. You may take pictures outdoors, but other than that, most of your wedding will be in a temperature-controlled facility. There are many reasons to utilize a winter wedding. 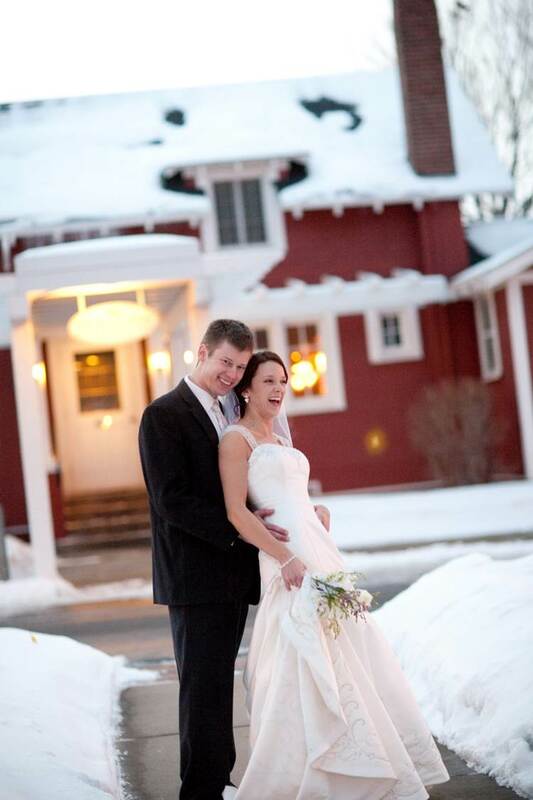 Whatever your reason, you can be sure that a Winter wedding at Earle Brown Heritage Center will be memorable. Our staff will help you with entertainment, food, decorations, and more. Contact us to learn more about availability and wedding detail options.